A federal judge is poised to order immigration authorities to close three family detention centers housing some 1,700 people awaiting decisions on their stay-or-go arguments. 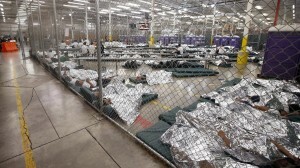 Dolly Gee, a U.S. District judge in Southern California, ruled that federal authorities have violated key provisions of an 18-year-old court settlement that placed restrictions on detention of migrant children. Writing for the “Above The Law” website, attorney Sam Wright makes a case for increasing the role that amicus briefs might play for immigration court policies. Sam Wright, described as “a dyed-in-the-wool, bleeding-heart public interest lawyer,” focuses on the specific case of Cristoval Silva-Trevino, the subject of a Texas-based case with national implications. A federal circuit court recently issued the latest guidelines in a years-long struggle over the case, but Wright makes the point that amicus briefs played an important role. For example, the Southern Poverty Law Center offered its opinion, along with another organization that the Center considers a hate-associated group. See how it plays out, read here. 1-year-old Joshua Tinoco faces deportation. Photo from Associated Press report, 7/4/15. The Associated Press reports on 1-year-old Joshua Tinoco, who pauses while playing at his relative’s home in Los Angeles. Writing from Los Angeles, Amy Taxin tells the story of a 1-year-old facing deportation even as his mother is allowed to stay. The story goes behind the numbers to outline human conditions. It also reminds us of some staggering numbers: More than 57,000 unaccompanied children from El Salvador, Guatemala and Honduras arrived on the border in the last fiscal year, and since then another 18,000, government statistics show. Immigration courts have fast-tracked the cases in a bid to stem a growing backlog. It’s an AP story, and they have legs. Let’s hope this one gets around.